Rio Evolution IPL is clinically proven to remove hair safely and effectively at home. Placed against the skin, pulses of intense light are delivered directly to the hair follicle with enough energy to disable the root without affecting the surrounding area. IPL is fast, gentle and delivers permanent hair reduction. Treatment is very quick, for example it only takes a couple of minutes to treat the underarm area. Periodic treatments every four to six weeks are required to ensure that there is no hair regrowth. It is ideal for fast and efficient long term hair removal, for use on the legs, arms, underarms, bikini line, back., chest and certain areas of the face. leaving your skin beautifully smooth and without a hair in sight. Not suitable for dark skin tones, for example, those of Afro-Caribbean, black African, Indian or Pakistani descent. Even if your skin tone appears to be suitable on the skin tone chart, do not use if close relations (parents/grandparents) have skin tones as described above. Not suitable for red, light blonde, grey or white hair. Step 1: 24 hours before you begin treatment check for any reaction by testing a small area of your skin, this patch test will confirm the maximum power level for your skin type. Step 2: When you are ready, shave the area to be treated, this ensures that the light energy goes directly to the hair root and avoids hair burning on the surface. Step 3: Turn the unit on, enter the security code, press the enable button then place the wand over the area you wish to treat. Ensuring the skin sensors are in contact with the skin press and hold the treatment button on the wand, this initiates the treatment flash. Step 4: After the treatment flash the unit will self-check, move the wand to the next area to be treated and repeat the process. When you have finished your treatment, turn the unit off and store in a safe place away from children. The timing for follow on treatments is not critical. We recommend treatments at 2 week intervals, although some people like to treat the area every week and others just once a month depending on personal preference and on where the treatment area is. As long as the hair follicle or surrounding skin is not red, sore or inflamed, treatment can be repeated after a minimum of 48 hours. 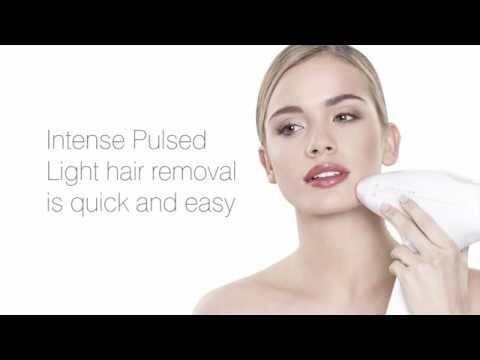 IPL Hair Removal is suitable for use on the legs, arms, underarms, bikini line, back, chest and certain areas of the face. A security button sequence is required to activate the unit. Your first treatment will always be on power level 1 and can only be increased by one level after a treatment is performed. The wand features a bright orange light which will cause you to blink if pointed directly at the eye. Treatment will only take place when all 4 skin sensors are in contact with the skin. The bulb is shielded to avoid any risk of stray light. The aperture includes a UV filter to reduce UV light exposure on the skin. You will need to leave 5 seconds between treatment flashes to allow the unit to fully recharge. Power can only be increased by one level per treatment flash. The skin sensors must be lifted off the skin between treatments to reset the wand. Not for use on or by children under 14 years old. Not for use on or by children between 14 and 17 years old without parental supervision.